A statue of Paul Chomedey de Maisonneuve who was a French military officer is displayed in Place d'Armes in Old Montreal, Quebec. The statue of Paul de Chomedey de Maisonneuve that stands in Place d'Armes inOld Montreal, Quebec is a memorial to this man who was a military officer and the founder of Montreal born in 1612 and died at the age of 64. At thirteen years old, he joined the military where he was recognized for his great ability and devotion and from there his life skyrocketed becoming a well recognized military officer. 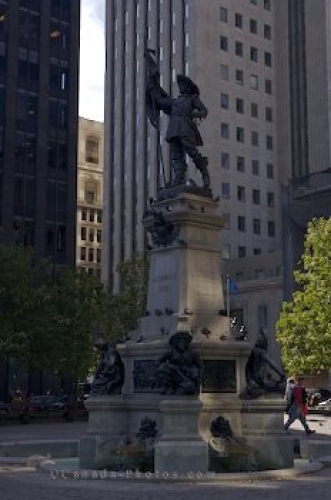 Statue of Paul de Chomedey de Maisonneuve, a military officer, in Place d'Armes, Old Montreal, city of Montreal, Quebec, Canada. Picture of a statue of a military officer known as Paul Chomedey de Maisonneuve in Montreal.